Glenmuir honour four of its retired teachers at a function held in the Auditorium of the school on Saturday May 3, 2008. Caption: "...just checking the ole eyelids for holes"
Caption: I\'m not sleeping, My eyes have retired like the teachers. Caption: This is what happen when you\'re retired. I should have said no to that last drink. Caption: Hurry up man, me ready fi leave to go a me yard. .
Caption: Retired, or just plain and simply tired. Caption: might as well ketch a five have to go work soon as mi lef yah so. Caption: Lady: I hope him nuh fall pon mi shoulder! Caption: Minister Henry seeks divine guidance on the future of retired teachers! 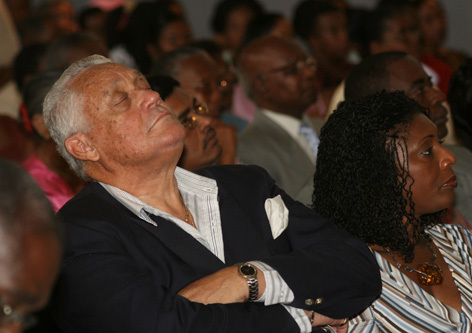 Caption: Lawd why dem a tek so long, dem jus a cut in pon me afternoon nap. Caption: "...and the final award of the night goes to a teacher that has always managed to stayed alert and present for his students...Mr Brown come up and receive your award...Mr Brown?.....Mr. Brown?? Thank you for the186 responses we received. Enter again and we hope you will be the outright winner next time.